Needlework Tool Caddy – Winner Announced! Good morning, peeps! It’s a lovely Friday here in Kansas – cold, but warming up later today. The sun will shortly be rising, the kids will shortly be walking past on their way to school, I will shortly be doing some needful chores, and shortly, the weekend will be upon us. I’m not sure why, but Friday always seems to be the shortest day of the week. It’s the day I want to savor. But there’s never a chance. It flies by – and the next thing I know, bam-o! It’s Monday again. Today – the 15th – is the day I sit down and work out wonderful things for Needle ‘n Thread. I brainstorm article ideas. I sketch in a publishing calendar for the next month. I write up lists of things to do and prioritize them. I see if I have all the supplies I need to accomplish what I need to accomplish in the next month, and if not, I order them. It’s the mid-month prep for the next month (and sometimes, beyond.) And I love doing it. Which brings me to the point that Christmas is coming – I’ll be preparing my To Do Calendar around that fact today – and if you didn’t win today’s give-away, you should definitely put one of these beautiful and exceedingly handy tool caddies on your Christmas list! I’ve grown really fond of mine. It’s a terrific tool for any workspace, but especially if you have a tight workspace. It keeps a lot of tools together in one neat space, and it does it while lookin’ good. Rarely do I look good when I’m being serviceable, but it’s nice to see that my tool caddy can manage it! 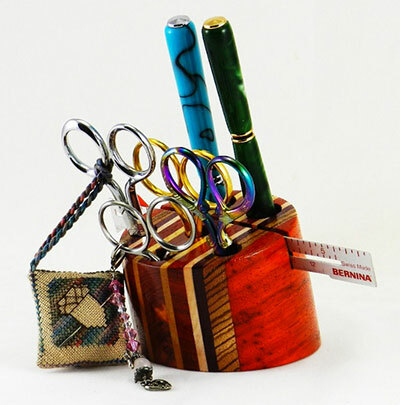 You can find the tool caddy on Etsy, at JR Crafter. Right now, I think they’re sold out, but keep an eye on the shop. Hopefully, they’ll have some in before Christmas. Remember, these are hand made by a father-son team, each one individually crafted and beautifully finished, and craftsmanship like this takes time. This tool caddy looks wonderful, and also small enough to tuck into a corner of a traveling work bag! Congratulations, PJ – please drop me a line with your mailing information, and I will send that along to the folks to JR Crafter, who will be sending you the beautiful little caddy. PJ! I like that, you know! I do! The first person to comment below with the name of the movie AND finish the quote, will receive a $25 gift certificate, courtesy of me, to my favorite needlework shop. If you chime in, make sure your email address is correct on the comment form. Just a little Friday fun. Why not? December 17, 2018 A Stitcher’s Christmas, 2018: Needlework Tools for Two! Robin hood! Hiss, put it on my luggage!! Gosh, you were fast, Veronica!! That was within about 4 minutes of my hitting the publish button! Im so happy I was up at 7 am prepping linens. I got sucked into your website, as I do every day since I found it. Never again will I complain about my younger sister quoting and singing from Disney movies. This is especially wonderful because I just started and so far have been making do with the odds and ends I found in my moms craft tubs… RED BOHIN SCISSORS here i come! (Which I had read about before I checked the home page for the 18th time… also read all your articles on paper embroidery and now I just Have to make some cards…). These will be my first pair of real embroidery scissors!!! My first!!!! Mary, you are absolutely marvelous! My weekend is made now even though Ill be frozen to my tippy toes. Congratulations Veronica. Christmas comes early sometimes eh. Good on you. Don’t tell anyone, but I had to enquire of Mr Google (or should that be Ms?) for my answer. That was fun Mary. Cheers, Kath. Well done, Veronica. I hope you enjoy your first embroidery scissors. Once upon a time I could recite every word from “The Railway Children” but I confess that I had to cheat and Google this question. Thank you for your lovely website and all the detailed instructions you put in. Disney’s Robin Hood from, I think, 1973? I always liked it because I like foxes :). Hiss, put it on my luggage. PJ! I like that, you know. I do! Hiss, put it on my luggage. Confession: I had to look it up! Hiss! Put it on my luggage! Happy Friday, Mary, and all of you readers! Quote said by Prince John in 1938 The Adventures of Robin Hood movie. Thanks! I am loving all the techniques that you are sharing! Happy stitching! Prince John said it in the 1973 version of Robin Hood. This was also one of my favorite versions of Robin Hood. Although I must admit that Men in Tights always gives me a giggle. Robin Hood. Prince John in the animated Disney version. …Hiss, put it on my luggage. P.J. I like that, do you know I do. Hiss, put it on my luggage. PJ! I like that, you know I do! Hiss, put it on my luggage. Congratulations to PJ too. You know we like that, you winning that is. P.J.! I like that! Do you know I do? Hiss, put it on my luggage! P.J.! I think I will have to buy myself one of those caddies, just love it and the laying tools. Sorry, forgot to put the movie name in first time. Love the caddy, will have to put that on my wish list. From memory it is Sir Hiss in Robin Hood. I think he goes on to say ‘put it on all my luggage!’ (My kids loved that movie). Congratulations PJ from Texas. Hope you enjoy your caddy! Congratulations, PJ in Texas! Pretty caddy. Mary, thanks for the tambour installments of late. I’ve been trying to get the hang of tambour for about a year. I gave up after several tries. After seeing how well you have progressed, I will pick it up again and keep at it. I guess it just takes a lot more practice. Perhaps I will create a training schedule like you did. Line from Prince John in Robin Hood – P.J. I like that, do you know! I do. Hiss, put it on my luggage. the answer is :Robin Hood. Prince John in the animated Disney version. The only movie I can think of is the Robin Hood movie. But the quote is a little off. Congratulations to PJ. on winning the caddy. Opps forgot to add the rest. “Hiss put it on my luggage” from Robin Hood (animated). Thanks Mary for the chance to win. Robin Hood and the last bit of the quote is: Hiss, put it on my luggage. Sorry, I responded too quickly. It was from the Adventures of Robin Hood. The last part of the line is “Hiss, put it on my luggage.” I’ve never responded to a blog before! I love your website, Mary, and can’t wait to see the next Mission Rose update! So sorry for the typo’s this morning. but it is Prince John and it’s from the animated Disney movie Robin Hood, “PJ I like that! You know I do! Hiss put in ON my luggage! The quote is from: Robin Hood. I think the quote is from Robin Hood (1973 version). It’s from ” Robin Hood”. The rest” of the quote is, “Hiss, put it on my luggage.” Very silly! Thanks for the giveaway! Prince John from Adventures of Robin Hood: Hiss, put it on my luggage. Mary, my guilty conscience is bothering me. I looked up the quote on Google. It just takes all the fun out of it, darn it. If anyone knew the quote without looking it up, I encourage them to write in. To pacify my conscience, I will watch the 1938 version of The Adventures of Robin Hood. I find myself looking forward to that. Robin Hood, loved the song. That would be Robin hood? PJ I like that, you know I do. Hiss put it in my luggage. Ahh–Disney’s classic Robin Hood! It’s been years since I’ve seen it. Now I have to check with the local library and with my friends who have grandchildren to find a copy to borrow, since you’ve reminded me that it is such a classic movie! Little John: [as Sir Reginald] Ah, milord, the esteemed royal sovereign of the realm. The head man himself. You’re beautiful. Hiss, put it on my luggage… Prince John! It’s from Robin Hood (1973). LOL, I love it too. Also love yourblog, thanksso much I’m learning alot and really appreciate your time. drumroll please…. The Adventures of Robin Hood of course. Now I need to go the Roger Miller song for the remainder of the day. Prince John in the animated Disney version of Robin Hood. Hiss, put it on my luggage, P.J.! Hiss put it on my luggage. Robin Hood! Hiss! Put that on my luggage. It is one of my very favorites as well. “Put that on my luggage!” from the best Disney movie, Jungle Book! I love reading your blog posts. My greatest problem these days has been to choose what of your neat embroidery styles to try! Thank you for your hard work! Have a great weekend, Abigail in Paris. P.J. I like that, do you know I do. Oops, forgot the movie name. The line is from the Disney animated version of Robin Hood (Robin & Maid Marion are foxes, Prince John a scrawny lion). I loved that movie; even bought the LP audio version. Thank you for a quick trip down memory lane! From The Adventures of Robin Hood. This is fantastic! Now I am wondering why in the world I slept in this morning . I will be loading it up with my favorite tools and scissors as soon as it arrives, and from then on it will be holding my tools unless one is in my hand. From the adventures of Robin Hood, said by Prince John about his new nickname!! Robin Hood. Hiss, put it on my luggage. I think of P.J. Soles And wonder where you are. I’ll never see you anymore. Where do you think they go? All the fallen stars. Heaven doesn’t know you like I do. How wonderful for you PJ. I know you enjoy having this cool caddy. From Disney’s Robin Hood – one of my favourite Disney movies! And congratulations to PJ in Texas on winning the tool caddy.